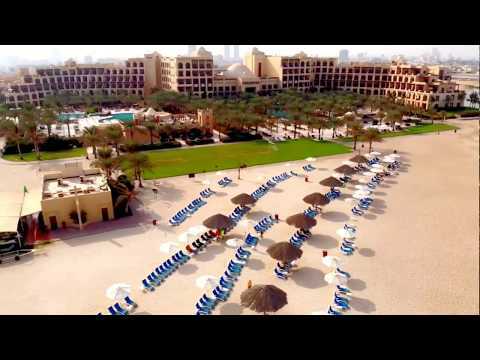 The Hilton Ras Al Khaimah sits on private sandy beach just over an hour away from Dubai City centre, and prides itself on delivering the utmost in service, accommodation and amenities. Its location, in a spectacular private bay on the most Northern tip of the Arabian Peninsula, in the Emirate of Ras Al Khaimah, overlooking a stunning sandy beach which stretches over 1.5 kms, is also unrivalled, with calm, clear waters, ideal for splashing about in. Grab a towel and relax by the zero-entry pool. The kids have a pool to call their own, a water slide and complimentary access to their own club to hang out in with a great indoor/outdoor play area. There are a choice of restaurants to enjoy to ensure no evening meal needs to be the same as the last and All Inclusive drinks include well known brands. Choose from one of the hotel rooms in the main building or opt for one of the villas located around the bay or one of the pools. At the tip of the Arabian Peninsula in the Emirate of Ras Al Khaimah, the resort is set on an 1.5 km stretch of white sandy beach, just over an hour from Dubai centre. The old town is 5 minutes away. Transfer time from Dubai International Airport: 1 hour 30 minutes. 475 rooms, suites and villa rooms. All with air-conditioning, LCD flat-screen TV, telephone, complimentary WiFI access, tea/coffee-making facilities, mini-bar*, safe, alarm/clock radio, iron and board, and hairdryer. Guest Rooms offer a terrace or balcony with city/garden views and 1 queen or king-size bed, sleeping maximum 2 adults and 1 child. All Inclusive option: includes buffet breakfast, lunch and dinner in the Maarid restaurant. For guests staying in the villas breakfast will be served in the Al Maeda Restaurant. A variety of drinks are available including hot beverages, still and sparkling water, soft drinks, cans of juice, Beck's beer, wine, spirits, cocktails and mocktails. All Inclusive Dine Around option: includes buffet breakfast, lunch and dinner in the Maarid restaurant, guests staying in the villas the breakfast will be served in our Al Maeda Restaurant. Lunch - receive a credit of AED 70 per person (children aged 6–12 years old will receive a credit of AED 35 per person) when you lunch in any of the restaurants and bars below. A charge will apply for any amount above the credit value. OR a 3-course à la carte dinner in any of the hotel`s outlets that are operating for dinner. A variety of drinks are available including hot beverages, still and sparkling water, soft drinks, cans of juice, Beck's beer, wine, spirits, cocktails and mocktails. Please note: mini-bar items, room service, items from BN Café, items from Mondo Café and items from Beach Butler are not included. All Inclusive and Dine Around is subject to change throughout the season. Half Board option: includes buffet breakfast and dinner to be taken in the Maarid Restaurant. If guests would like to have an à la carte dinner in the evening they are entitled to a AED 70 discount at Pura Vida and Piaceri da Gustare. Full Board option: available at a supplement. Deluxe Sea View rooms have a balcony and a variety of bedding options, sleeping maximum 2 adults and 1 child. Deluxe Pool View Villas, face the resorts pool from a balcony or terrace. Deluxe Sea Front (upper floors) and Deluxe beach access Villa (ground floor) are also available. Junior Suite Sea Front Villa (upper floors) offer a seperate living area and balcony overlooking the sea. Junior Suite beach access Villas (lower floors) are located in a villa of the resort, with a spacious terrace and direct access to the beach. Book All Inclusive and receive a free upgrade to Dine Around All Inclusive. Valid for stays completed between 18 Apr - 31 Oct &apos;19 for bookings made by 15 May &apos;19. 9 restaurants and bars; Maarid (International buffet; open for breakfast, lunch and dinner, kids&apos; meals available), Pura Vida (South American Churascaria; open for dinner. Closed on Tuesdays), Al Maeda (Lebanese restaurant. Closed on Mondays), Piaceri da Gustare (Italian fine dining with a vast wine menu. Closed on Sundays). BN Café, Dome Lounge, Sol Bar, Rio Beach Bar, Sunset Bar and X.O. 7 swimming pools, including salt water pool and 2 kids&apos; pools. Spa* with 9 treatment rooms, sauna, Jacuzzi, 2 Turkish Hammam bath and spacious steam. 24-hour fitness centre, aerobics and relaxation rooms. Water sports* including water-skiing, windsurfing and snorkeling. Beach volleyball. Tree House kids club (ages 4-9 years; children under 4 years with a parent or babysitter*), with indoor/outdoor playground over 2 floors and garden area. The Hide (ages 10-16 years). Babysitting* (on request). Shopping arcade. Laundry service*. 24-hour room service*. Evening shuttle service to Ras Al Khaimah malls. Shuttle service to Dubai Mall* (twice a week). Dress code: a smart casual dress code applies for dinner at Al Bahar and Piaceri da Gustare (gentlemen are required to wear long trousers and ladies knee-length skirts, dresses or trousers).